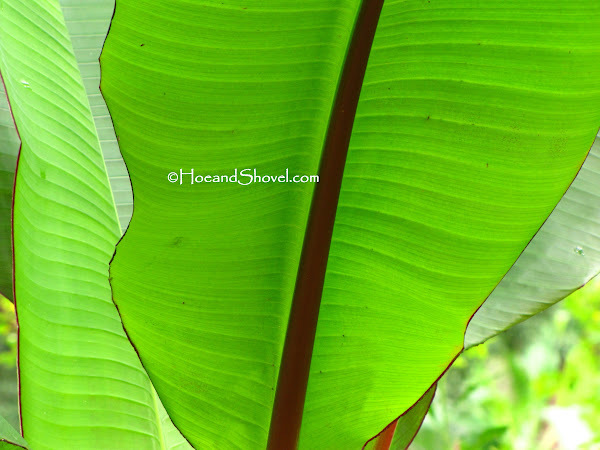 There's nothing that speaks tropical quite as boldly as enormous paddle-shaped leaves of banana trees. Non-fruit-bearing Red 'Ensete Maurelii' bananas are just so lovely amidst the shade garden. It is here where moisture is naturally retained better than any other parts of the garden. Mixing in elements of any large-leaved specimen adds a particularly appealing dimension to the garden. Feelings of exotic rainforest gardens come to mind and hot humid environments are the perfect place for them. 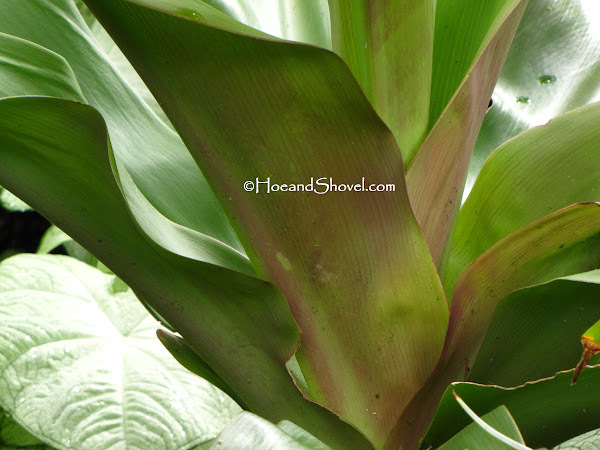 Large leaves come in various shapes and color tones. The rounded shape of Begonia 'rotundifolia' leaves, at the base of a Red Banana, are accentuated by the magenta hued veining they sport. Queen Emma is known for her elongated presence and stately stance in the tropical pathway. All the Queens are wearing deep battle wounds from their plight with Eastern Lubber Grasshoppers that make her their first choice with voracious appetites. Makes. Me. So. Sad. At the back end of the tropical pathway is one of my very favorite Alocasias. The 'Plumbea Nigra' is noted for its very dark, 18"-24" leaf length and puckering foliage surface. The top of the leaf is dark green with the underside and stem being black-ish magenta. Just a beautiful stand out next to the Red Banana and bromeliads at their feet. Philodendrons of all sorts say "tropical and exotic". The 'Rojo Congo' must be kept in the shade but requires little else. 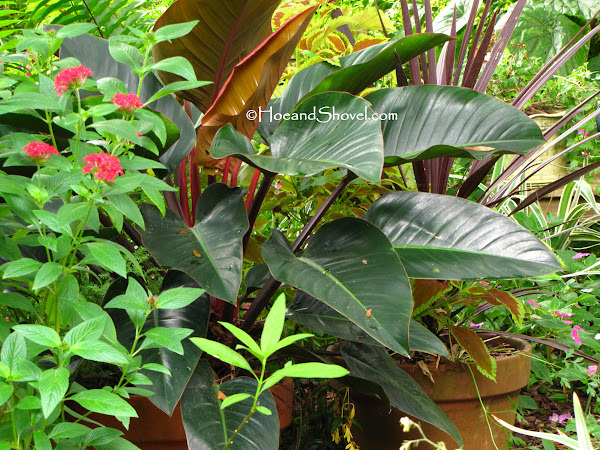 The bright red petioles against its deep green, large leaves that emerge redish-brown just take my breath away. I've kept 3 of them in containers so they can be moved for protection against frost. Caladiums most certainly fit into the category of large exotic leaves. Summer comes alive with their happy heart-shaped faces throughout the garden. 'White Queen' pops in the central pathway with cast iron leaves of green next to her. 'Red flash' is one of the largest leaves of any caladium variety. Elephant ears of Alocasia 'Portadora' are without question the largest leaves in my garden. Easily 3' long and almost as wide. Half of me could hide behind them. Their upright habit is very different from the drooping leaves of most common elephant ears which I do NOT prefer. This one not-so tiny trait makes all the difference for me. 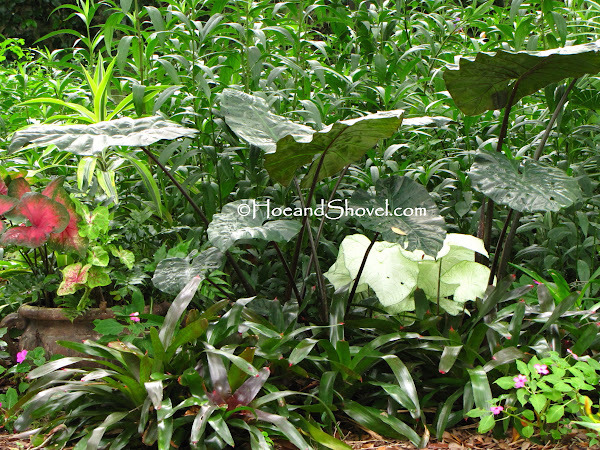 Snuggled up under this particular 'Portadora' (there are three others in the berm) is the show-off Colocasia 'Mojito'. And still another layer beneath them is more White Queen caladiums (barely seen in this photo). 'Mojito' grabs attention with its very large lime green leaves and black/purple-ish splotches randomly splattered about each large leaf. 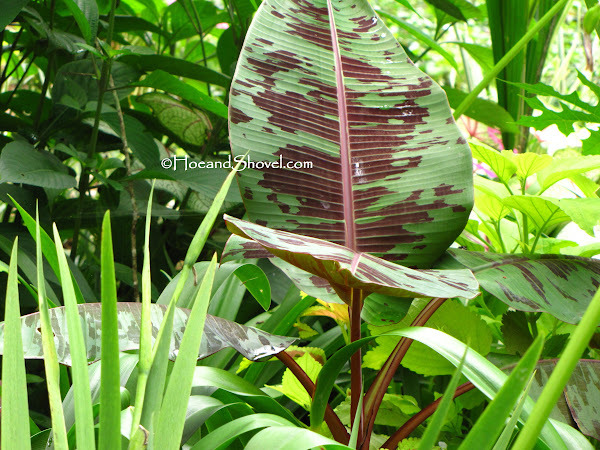 The ever-so-common Split-leaf Philodedron or Selloum is in close competition for being the largest leaf in the garden. I take them for granted. They are so easy and care free. Standing at least 12 feet tall and almost as wide several of these monsters create the foundational backdrop for my back gardens. Under the shade of the oak trees they rarely even freeze back. A young (second year) Musa 'Siam Ruby' banana is causing me to question whether it is sited correctly. It has me guessing if it is getting enough sunlight as it is not quite as tall as I would have expected by now. I chose it for the odd leaf-coloration and red stems. It's a cheery addition and I'm keeping my hopes up for it liking this spot. As I write this I realize I left out a few others that I seem to take for granted just like the Selloums above which are such stalwart foundational plants. My garden is full of Saw Palmettos (Serenoa Repens) that I adore. I should give them their very own blog entry they are so valuable to me. 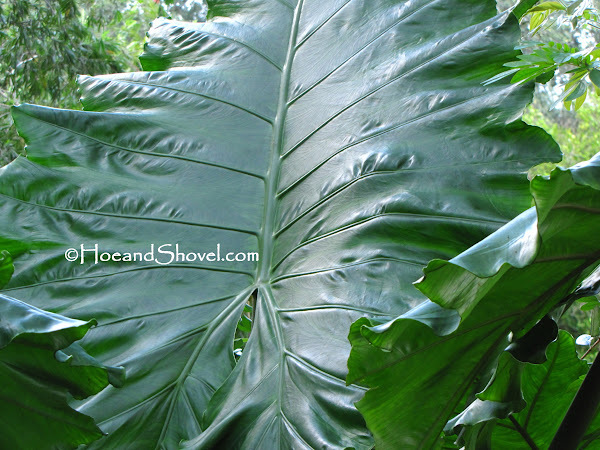 What are your favorite large leaves in the garden? Feel free to wander over to my most recent Lowe's Creative Ideas Post Entry. Wow! Those elephant ears seem life-sized! What a beautiful tribute to these tropical wonders! What beauties these all are. Thanks for sharing these larger wonders from your gardens. It is a wonder when we think about the size of just one leaf, one stem... truly remarkable works of nature! Thank you. Wonderful story. 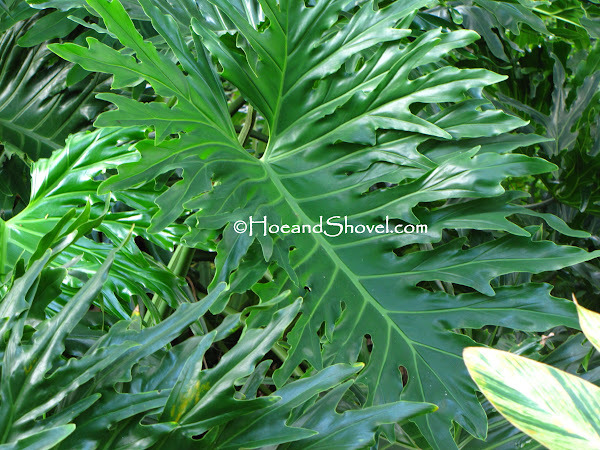 We enjoy the Xanthosoma Lime Zinger http://goo.gl/QP8WE and the dwarfer Hope Philodendron http://goo.gl/qR4vB which stays under 5 feet tall but still forms a big clump. I love how you mix it together and make it so interesting. Great ones to mention! I've had my eye on the Lime Zinger for a while... will need to take out more lawn to make room for it or give up some caladium space. :-) It would make a lovely addition to a container, too, but I'm trying to resist water-needy containers at this point. My Xanadu is kind of like a dwarf philodendron that I adore when they don't freeze back and I have to wait for them to return. I'm not adding any more of them but the ones I have are treasured. I love the large leaves.it does say "tropical",doesn't it? Love your's. 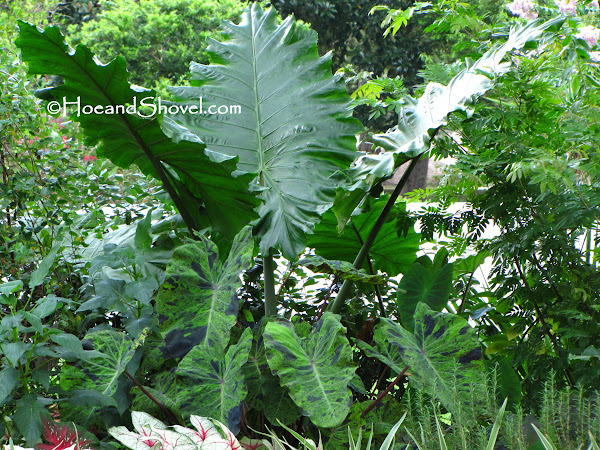 Large leaves definitely give a garden that tropical feel...and, you've got a nice variety of varying shapes and sizes. 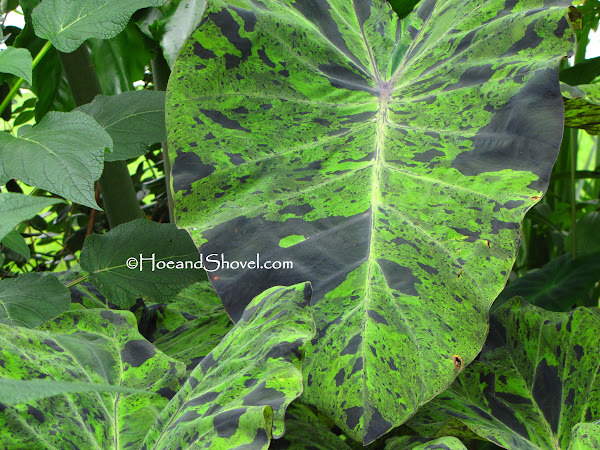 Follow your site daily...really enjoyed today as I believe the large leaves are what screams tropical! Your combinations of plants really inspires me. 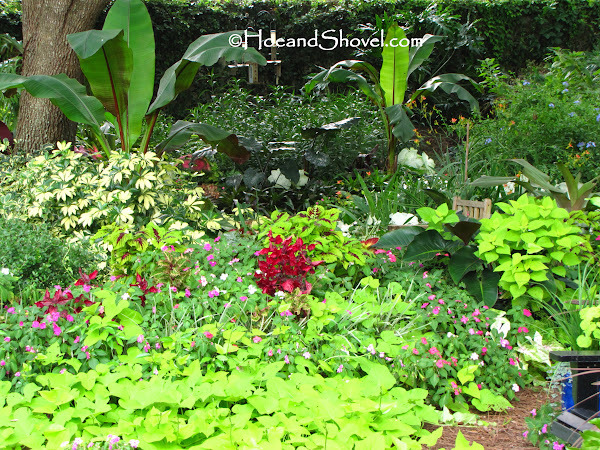 That huge elephant ear is beautiful with the mojito and caladiums at its feet. The large leaves are a favorite of mine too, but some of my alocasias are slow to return this year and are very tiny even now in late summer. Perhaps I haven't sited them well. My red banana is not very tall this year either. Last year I had a stand of 3-4 that were as tall as the 6' fence. Maybe next year they'll be tall again. You certainly place all your large leaved varieties to best advantage. Oh, wow, I'm not sure which one I like the best!! All are so dramatic and make such a statement! Large leaves sure take a beating when we have hailstorms here in Texas, though. The Rojo Congo is very cool!! Those large leaves really give the garden a tropical look. With my tiny garden, I only have some caladium in that large-leaf category. You have such beautiful collection. Hi Meems, It's great to hear from you again. I always love seeing your gorgeous garden. ALL of the leaves are special--but my favorites are the Caladiums. I tried growing them one year but they don't do well here. I love them though..
A. 'Portadora' is one of my all time favorites. Mine were creamed to the ground this past winter and are still looking wimpy as of August 1st. Beautiful foliage shots!!! I didn't even include the beautiful Australian fern leaf. Next time. They are really fun to mix in with the natives and sturdy perennials. So nice of you to visit. 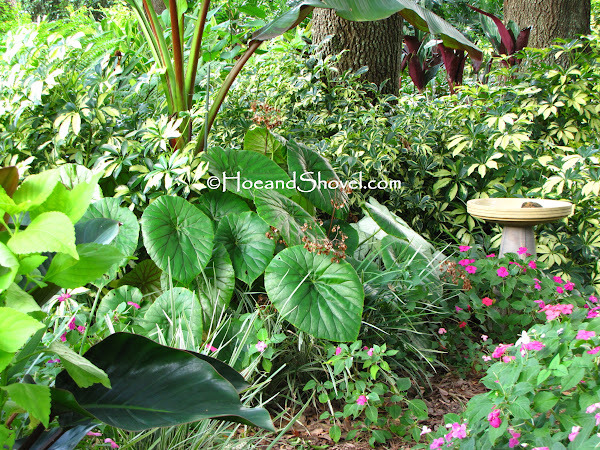 That tropical touch with large leaves is a fabulous dimension in a Florida garden. Come back often. Hailstorms would surely do my large leaves no favors. Even the (falling)sticks from the hovering oak trees present problems at times. AS a matter of fact I've tried to place the bananas out of the way of wind altogether. 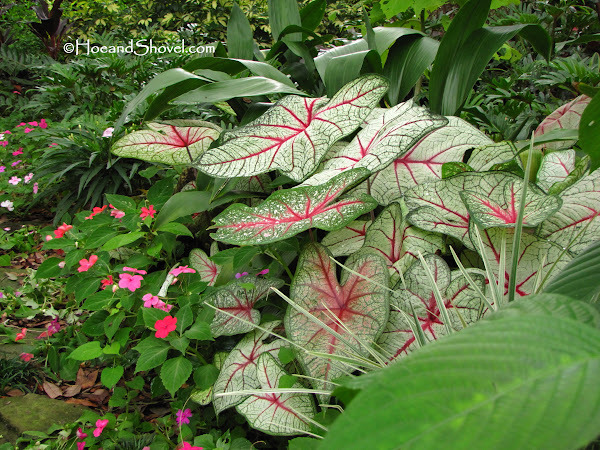 Caladiums bring that large leaf element to smaller gardens. 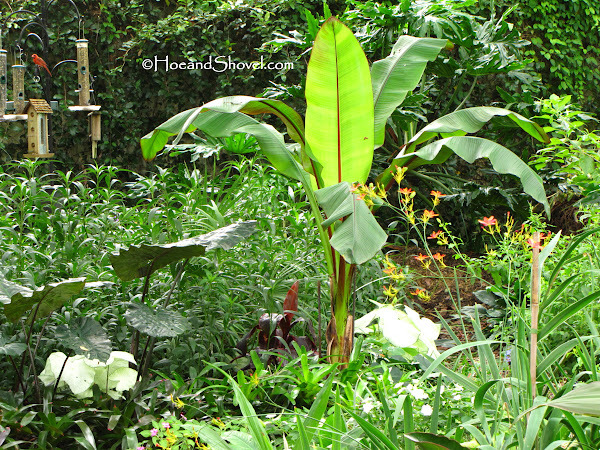 A variety of leaf shapes can be added to any size garden... you could always add a taller large leaf like a white bird. 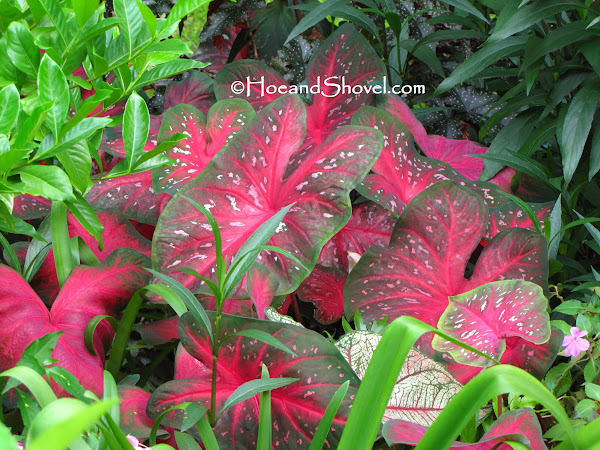 Caladiums appreciate moist but not wet organic soils. Try some in a container pot and keep it in partial shade... they should do fine for you. I'm sad to hear your Portadoras have not returned with gusto. It WAS an unusually cold winter for you. I was so impressed with your garden when Portadoras were at their prime. Here's hoping August is their best month. I had to look up Rice Paper Plant. But wow. What a surprise beauty. I'm wondering why I've never seen one or heard of it before. Now I'm trying to figure out where to get one and where to put it! Always so much fun to come here to see what my tropicals are supposed to look like. I'm going to drag my monitor out to the garden so they can get an idea of what I'm now expecting from them. Thanks for giving us all those names. I'm going to keep my eyes open to see if I can't find a couple for my own garden. Hi Meems, it's good you have a large area, which now seem like a real happy tropical setting. They are even more lush there than here. 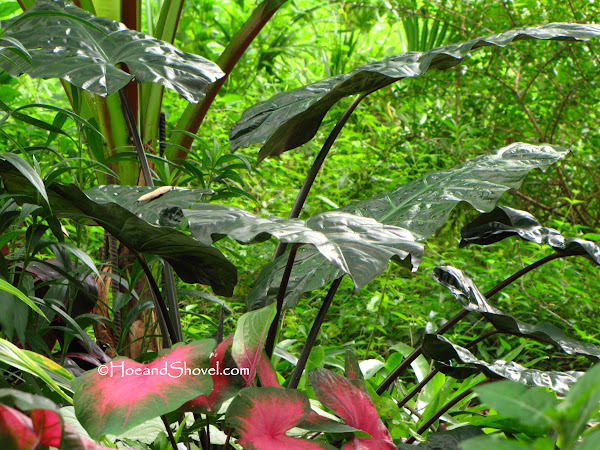 I can visualize our light green Alocasia and the Clerodendrum speciossisimum blending well too in your area. I just cut the Alocasia because we have too plenty through the years. I have my eye on a lime green Alocasia if I could figure out where to put it. The Pagoda flowers are all in the front garden. 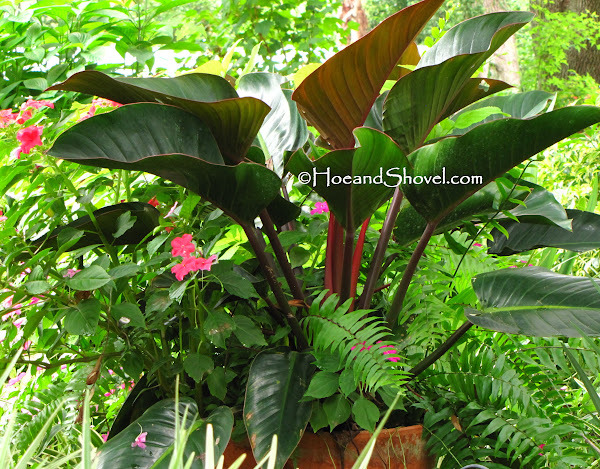 We love using the large leaves to give gardens a tropical feel at DSlandscaping. Great pictures it shows the plant brilliantly.